Aims: The aim of this study is to evaluate the hardness and degree of conversion (DC) of different bulk-fill materials when cured with the Quartz Tungsten Halogen (QTH) and Light emitting diode (LED) devices using same energy density. Settings and Design: This was in vitro study. 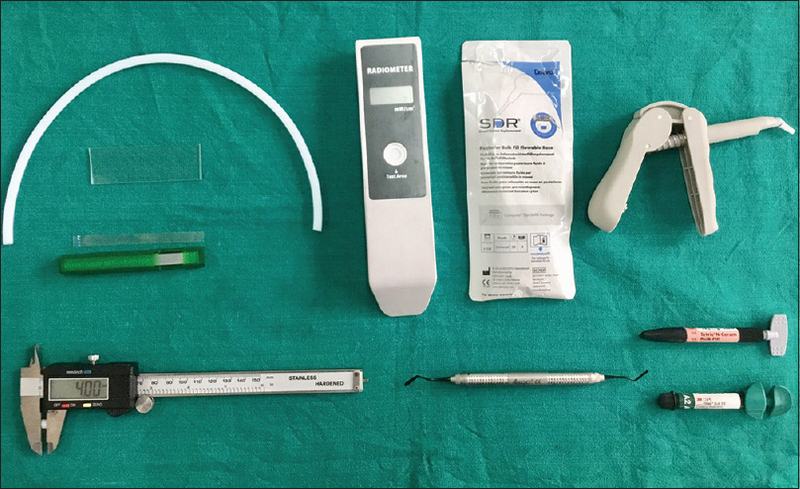 Materials and Methods: Three different bulk-fill materials, i.e., Filtek™ [3M ESPE], Tetric® N-Ceram [Ivoclar Vivadent], and SDR (Smart Dentin Replacement) by Dentsply Caulk, were used for making 180 samples (60 samples each) in Teflon mold. Out of these 60 samples, samples of three heights were prepared, i.e., 2 mm, 4 mm, and 6 mm (20 each). All the sample molds were filled in single increment and were exposed to the QTH and LED using the same energy density. Then, these samples were tested for microhardness using the Vickers hardness (VH) testing machine (Mitutoyo, Japan) and DC using Fourier Transform Infrared Spectroscope (Cary 630 FTIR Agilent Technologies, Germany). Statistical Analysis Used: The statistical analysis was performed on the collected data. The Kolmogorov–Smirnov and Shapiro–Wilk tests showed that the data are normally distributed. Since all the variables were continuous and statistically independent, independent t-test was applied to compare mean values of VH and DC of inter groups. 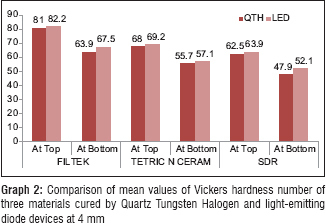 Results: The statistical analysis of readings revealed that there was no significant difference in the mean values of microhardness and % DC for both groups cured by QTH and LED. Conclusions: It can be concluded that irrespective of the type of the light cure unit if the energy density applied is same then almost similar performance can be expected from the devices. Smart Dentin Replacement (SDR), Dentsply Caulk, Milford, DE, USA. Twenty samples were of 6 mm height. Group III: Ten cylindrical samples of composite material A, B, and C, each with the 4 mm diameter and height 6 mm. Group VI: Ten cylindrical samples of composite material A, B, and C, each with the 4 mm diameter and height 6 mm. For the purpose of generating the same energy density, the irradiation time was set accordingly as shown in [Table 1]. The mean values for VH of various experimental groups with sample heights of 2mm, 4mm and 6mm respectively were obtained as shown in [Table 2], [Table 3], [Table 4]. VH was recorded for top surface and the bottom surface. Also the bottom/top % was calculated. Comparison of materials cured by QTH was done with materials cured with LED. Similarly the [Table 5], [Table 6], [Table 7] shows comparison of mean values of DC of various experimental groups used in the study. On comparing the mean values of both parameters (cured with QTH and LED) used in the study overall difference observed was statistically insignificant. 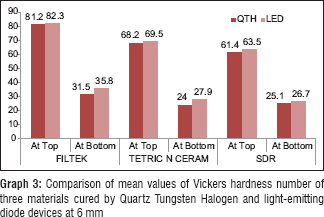 Overall on comparison of the VH for different materials at three different heights of 2, 4, and 6 mm along with bottom/top percentage, it was observed that the mean value of VH at various levels was more for LED as compared to the QTH. It can be seen in following graphs [Graph 1],[Graph 2],[Graph 3]. However, the difference was not statistically significant. This study has shown that when different composite materials are irradiated with the same energy density using two different light-curing units, there is no significant difference observed in surface hardness values obtained. In concurrence with the present study, Halvorson et al. showed that regardless of the light-curing mode, providing similar energy densities will result in similar microhardness. A similar conclusion was also depicted by Gomes et al. However, a study by Esmaeili et al. has concluded that different light cure units (QTH and LED) with same energy density do not result necessarily the same hardness number in composites. The results obtained in the present study % DC ranged between 58.25% and 64.65% for 2 mm and 4 mm for both QTH and LED, these results lie within the acceptable range of 55%–75% as mentioned by Galvão et al. However, at 6 mm level, they ranged between 33% and 39% indicating the polymerization level below the acceptable range of 55%–75% as shown in [Graph 4]. The results of this study are in coherence with the study conducted by Halvorson et al. also a study by Nomoto et al. who had concluded that when similar energy densities are supplied to the composite resins, similar DC and depth of polymerization will be obtained regardless of the curing mode. Soares et al. in their study reported that for occlusal restorative layers DC values should be at least 55% which conceded with the results of the present study. 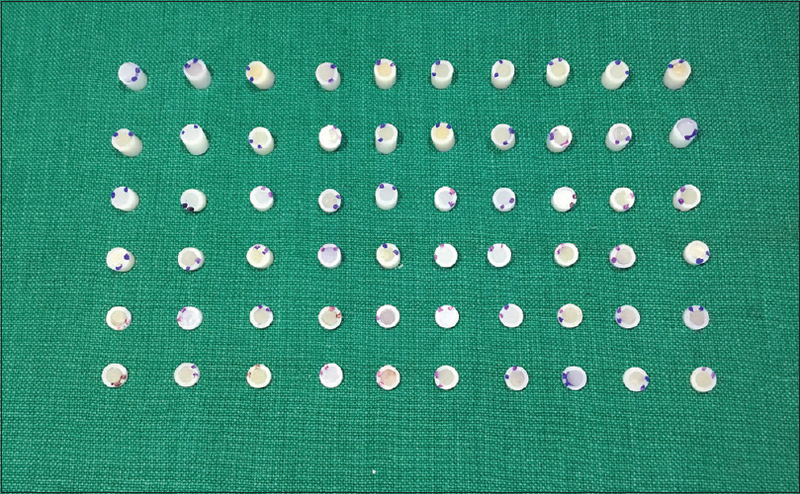 The energy density employed in this study was 14 J/cm 2 for both light-curing units. 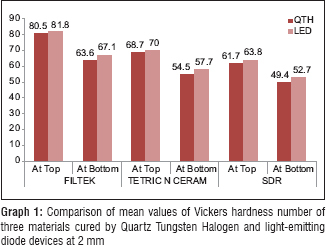 When QTH and LED were irradiated with the same energy density all the three bulk-fill resin composites showed almost similar values for microhardness at the top surface, bottom surface, bottom/top percentage ratios and % DC at three levels of 2 mm, 4 mm, and 6 mm height. It can be concluded that irrespective of the type of the light cure unit if the energy density applied is same then almost similar performance can be expected from the devices. Galvão MR, Caldas SG, Bagnato VS, de Souza Rastelli AN, de Andrade MF. 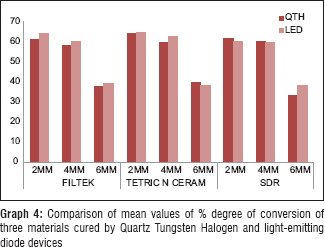 Evaluation of degree of conversion and hardness of dental composites photo-activated with different light guide tips. Eur J Dent 2013;7:86-93. Dionysopoulosa D, Tolidisa K, Gerasimoua P. The effect of composition, temperature and post-irradiation curing of bulk fill resin composites on polymerization efficiency. Mater Res 2016;19:466-73. Kim EH, Jung KH, Son SA, Hur B, Kwon YH, Park JK, et al. Effect of resin thickness on the microhardness and optical properties of bulk-fill resin composites. Restor Dent Endod 2015;40:128-35. Li X, Pongprueksa P, Van Meerbeek B, De Munck J. Curing profile of bulk-fill resin-based composites. J Dent 2015;43:664-72. Finan L, Palin WM, Moskwa N, McGinley EL, Fleming GJ. The influence of irradiation potential on the degree of conversion and mechanical properties of two bulk-fill flowable RBC base materials. Dent Mater 2013;29:906-12. Ajaj RA, Yousef MK, Naga AI. Effect of different curing modes on the degree of conversion and the micro hardness of different composite restorations. Dent Hypotheses 2015;6:109-16. Correr AB, Sinhoreti MA, Sobrinho LC, Tango RN, Schneider LF, Consani S, et al. Effect of the increase of energy density on Knoop hardness of dental composites light-cured by conventional QTH, LED and xenon plasma arc. Braz Dent J 2005;16:218-24. Alrahlah A, Silikas N, Watts DC. Post-cure depths of cure of bulk fill dental resin-composites. Dent Mater 2014;30:149-54. Rueggeberg FA, Caughman WF, Curtis JW Jr., Davis HC. Factors affecting cure at depths within light-activated resin composites. Am J Dent 1993;6:91-5. Coffey O, Ray NJ, Lynch CD, Burke FM, Hannigan A.In vitro study of surface microhardness of a resin composite exposed to a quartz-halogen lamp. Quintessence Int 2004;35:795-800. Hubbezoǧlu I, Bolayir G, Doǧan OM, Doǧan A, Ozer A, Bek B, et al. Microhardness evaluation of resin composites polymerized by three different light sources. Dent Mater J 2007;26:845-53. Thomé T, Steagall W Jr., Tachibana A, Braga SR, Turbino ML. Influence of the distance of the curing light source and composite shade on hardness of two composites. J Appl Oral Sci 2007;15:486-91. Abed YA, Sabry HA, Alrobeigy NA. Degree of conversion and surface hardness of bulk-fill composite versus incremental-fill composite. Tanta J Dent 2015;12:71-80. Miletic V, Pongprueksa P, De Munck J, Brooks NR, Van Meerbeek B. Curing characteristics of flowable and sculptable bulk-fill composites. Clin Oral Investig 2017;21:1201-12. Halvorson RH, Erickson RL, Davidson CL. An energy conversion relationship predictive of conversion profiles and depth of cure for resin-based composite. Oper Dent 2003;28:307-14. Gomes GM, Calixto AL, Santos FA, Gomes OM, D'Alpino PH, Gomes JC, et al. Hardness of a bleaching-shade resin composite polymerized with different light-curing sources. Braz Oral Res 2006;20:337-41. Nomoto R, Uchida K, Hirasawa T. Effect of light intensity on polymerization of light-cured composite resins. Dent Mater J 1994;13:198-205. Soares LE, Liporoni PC, Martin AA. The effect of soft-start polymerization by second generation LEDs on the degree of conversion of resin composite. Oper Dent 2007;32:160-5. Anderson C, Caetano T, Dutra BB, Panfiglio SG, Ferreira BB, Pinto HN, et al. Impact of light curing source and curing time on the degree of conversion and hardness of composite. J Rest Dent 2013;1:91-7. Lima AF, de Andrade KM, da Cruz Alves LE, Soares GP, Marchi GM, Aguiar FH, et al. Influence of light source and extended time of curing on microhardness and degree of conversion of different regions of a nanofilled composite resin. Eur J Dent 2012;6:153-7. Ozturk B, Cobanoglu N, Cetin AR, Gunduz B. Conversion degrees of resin composites using different light sources. Eur J Dent 2013;7:102-9.